Ohhh, who would have guessed there's an intriguing mystery taking place in the world of paper art?! While perusing the blog Blue Velvet Chair, I noticed a comment about an artist who has been surreptitiously depositing intricate book sculptures in literary locations around the capital city of Scotland since March. "It started with your name @byleaveswelive and became a tree.… ... We know that a library is so much more than a building full of books… a book is so much more than pages full of words.… This is for you in support of libraries, books, words, ideas….. a gesture (poetic maybe?)" The elusive creator remained anonymous despite a good bit of news coverage. Several months later, another discovery... this time The National Library of Scotland received a gramophone and coffin sculpture constructed from the book Exit Music by Ian Rankin, UK's bestselling crime author. Again, a Twitter address on a handwritten tag that read, "For @natlibscot - A gift in support of libraries, books, words, ideas... (& against their exit)"
In June a sculpture was left at Filmhouse, an indie film cinema. It's a theater scene with the audience seated on a stack of books, viewing men on horses emerging from the movie screen. This tag message supports libraries and all things *magic*. I might mention that one of the audience members is wearing a tiny photo of Ian Rankin's face. Show of hands... anyone else getting chills from all of this amazing creativity? In August, two more sculptures appeared on the very same day at the bustling Edinburgh International Book Festival, one at the Bookshop and another at UNESCO Edinburgh City of Literature. Once again the mystifying artist managed to slip in and out unnoticed. The most recent discovery on August 30 at the Central Lending Library on George IV Bridge is a paper magnifying glass balanced on a book. The tag references poet Edwin Morgan as did the first sculpture, and the message is a play on the high cost of precious literature. I'll be keeping an eye on this fascinating puzzle via photographer Chris Scott's blog, and wonder if we'll ever know the identity of the elusive artist. Meanwhile, plans are being made in Edinburgh to bring all seven sculptures together... that's one exhibit I would love to see! Enjoy this STV News segment. Very intriguing and suer cool! 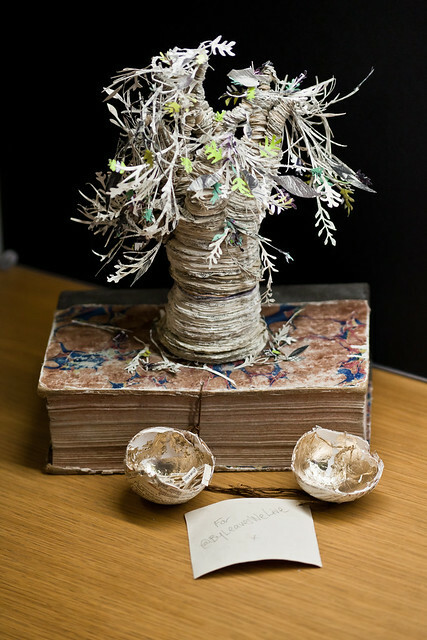 A Bansky for the world of Book Sculptures!! I got CHILLS (good ones!) reading this. All my life, books have been my friends, my company, my comfort, my source of information. Libraries & bookstores are my favorite places to be. This artist is my new hero. What an amazingly talented person & what a beautiful way to support the love of books & reading. Ahhhh! This post made me day! THANK YOU! Wow! what a nice post Ann.Such a super talented person cannot be unanimous for long. I am sure I will be seeing a post by you about the artist soon . wow the art is awsome, its ashame the artist hasnt revealed his name., thanks for sharing!!!! Those are amazing. I love all the mystery behind them too. How fun! And what amazing and beautiful works of art. It will be interesting to see if the artist is ever identified. You always surprise me with your beautiful creations! It's a whodunnit to go down in history. I think the sculpture must be enjoying the thrill of keeping us all guessing. A magician never reveals the secrets! I love the paper tree and the act of leaving these sculptures randomly. Beautiful. Definitely a Banksy in Book form!! well I'm amazed! Such beautiful works of art; I love them! How fascinating, the art is amazing! Ann, what a great idea of mysterious boook sculptures! They are amazing by themselves, but this mistical destiny of each sculpure make the whole story more enchanting!